An Ontario-specific version of fungicide ratings by Dr. Tom Zitter (Cornell University) for late blight was compiled by Janice LeBoeuf (OMAFRA) in 2015 and is posted here. Zampro (Group 40 + 45, ametoctradin + dimethomorph): dimethomorph is rated ++ by Dr. Tom Zitter; Zampro was equivalent to programs using ++ and +++ rated fungicides in a trial in Pennsylvania. Orondis Ultra (Group U15 + 40, oxathiapiprolin + mandipropamid): mandipropamid is rated ++ by Dr. Tom Zitter; oxathiapiprolin provided very good (+++) control when applied in rotation with ++ rated fungicides in a trial in Pennsylvania. Early blight disease pressure is inconsistent at the Ridgetown Campus, University of Guelph. Ratings represent results of only one efficacy trial when disease pressure was high. Therefore, it is not possible to include observations on product consistency in ratings. Septoria leaf spot pressure is inconsistent at the Ridgetown Campus, University of Guelph. Ratings represent results of only one efficacy trial when disease pressure was high. Therefore, it is not possible to include observations on product consistency in ratings. 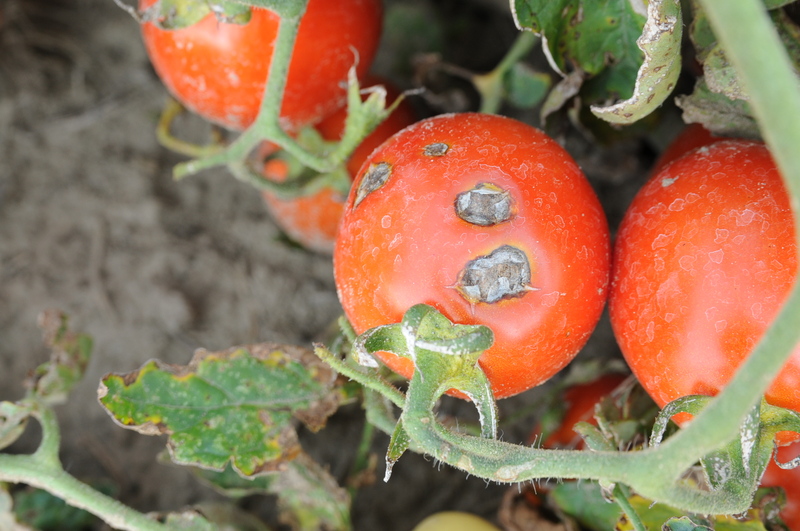 If you didn’t find the product information you were looking for, check out the fungicide efficacy ratings from other locations: Wisconsin (late blight), New York (late blight), New York (late blight, early blight), Georgia (various tomato diseases). 0 (no effect) no difference from control plots that receive no fungicide; + (poor) inconsistent control and/or some effect at reducing; ++ (OK to good) consistent control, does not perform as well as +++ products in all years; +++ (very good) consistent control, consistently one of the best fungicides in the trial. ** These products are labelled for early blight on field tomatoes but have also shown efficacy against anthracnose and may be beneficial when applied for early blight control. 0 (no effect) no difference from control plots that receive no fungicide; + (poor) some effect at reducing; ++ (OK to good) does not perform as well as +++ products; +++ (very good) one of the best fungicides in the trial. ** These products are labelled for early blight on field tomatoes but have also shown efficacy against Septoria leaf spot and may be beneficial when applied for early blight control.